Whether you want to perform hair cuts and hair styling from the comfort of your own home, own your own small salon or own a large salon with a huge staff, finding the barber chairs that you need is easier than you might imagine. Thanks to the Internet, comparing and contrasting different models and prices is simple to do. In the past, shopping for barber chairs meant leafing through confusing catalogs or being at the mercy of the single business in town that supplied them. Nowadays, you can get very competitively priced barber chairs that will make running your own salon – big or small – much easier and more affordable. On the low end of the price range, the Ariana Styling chair is very competitively priced at only about $190. At that price, just about anyone can afford to buy a professional, high quality barber chair. If you need to buy many barber chairs, the Ariana Styling Chair is probably a great option since it has such a low price tag. People who are just starting out and need to outfit their salon with enough barber chairs will find the Ariana Styling Chair makes it very easy – and reasonable – to do. Having enough barber chairs to handle all of your stylists and clients is essential, and the Ariana Styling Chair makes buying in bulk much more feasible. If you’re more interested in extra features and exceptional comfort, there are plenty of barber chairs out there to suit your needs. 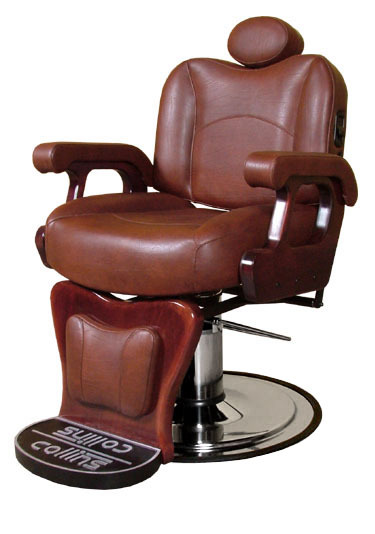 The Sam’s Club Traditional Barber Chair comes with a price tag of approximately $450 and boasts many attractive qualities. It is very adjustable, for one thing: from the back to the headrest to the swiveling action, this chair makes styling a breeze. Unlike many barber chairs, the Sam’s Club Traditional Barber Chair is made out of tough, resistant – yet comfortable – PVC vinyl. This chair will stand the test of time, and should make for a wonderful addition to any salon. When money is not an issue, splurging on top of the line barber chairs may be in order. In that case, you can’t do much better than the Conquest Barber Chair. Ringing in at just over $2,400, the Conquest barber chair is made out of heavy duty steel and features a rugged, unique octagonal design. Clients and stylists alike are sure to admire this chair, and it is a true shining star in the world of barber chairs. With its steep price tag, though, many people will be limited in how many they can buy; smaller salons are more likely to find this chair acceptable.